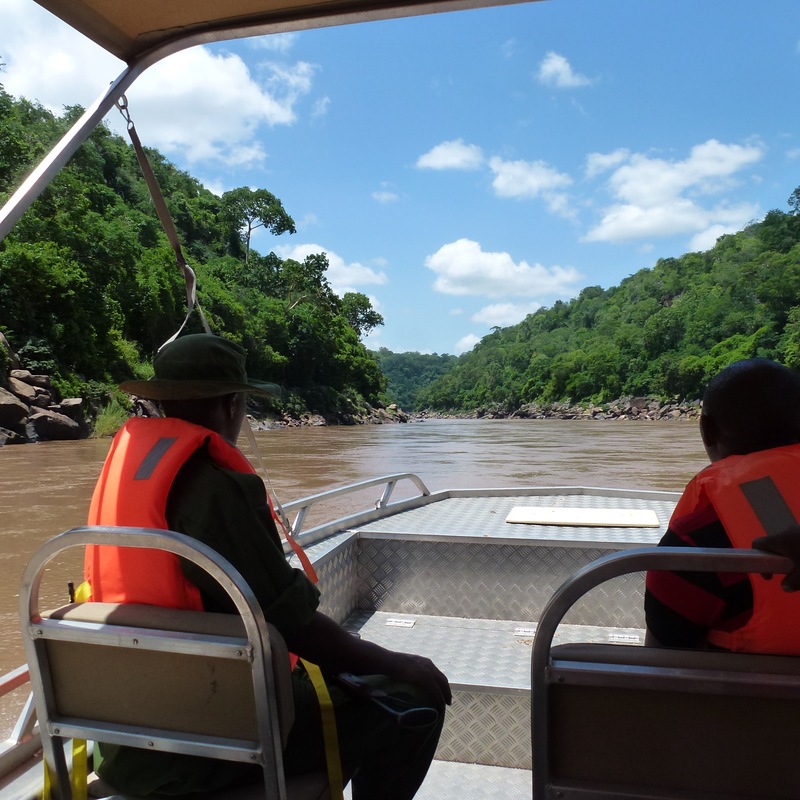 Tanzania’s largest river, the Rufiji, cuts through the northern part of the Selous Game Reserve and forms the southern boundary of the photographic tourism sector. The whole area south of the river is earmarked for sustainable hunting tourism, which was by far the greatest income earner of the reserve in the past. At Stiegler’s Gorge the huge river passes through a narrow gorge. Around 1900, the area had by then already been protected by the colonial Government and the Germans planned some infrastructure, including a road and some type of river crossing. A Swiss engineer by the name of Stiegler was surveying the land in 1907. His habit of hunting elephants in his free time caused him trouble. He wounded an elephant and followed it. The beast suddenly charged, which induced his gun bearer to disappear, unfortunately taking the gun with him. That was the end of poor Stiegler. When I started to work in the Selous in 1987 under a Tanzanian-German Government Agreement, the north bank of the river above the gorge consisted of many deserted buildings and a couple of square kilometers full of rubble and rubbish. There was even a cable over the river and a left behind cable car. We managed to get the VW-engine running again and several of the more courageous game wardens (not me) crossed the river halfway with the cable car before they lost courage to continue. These were the leftovers of surveying the Gorge to determine whether it was suitable for a large dam that could have been a source of electricity. Shortly after Tanzania’s independence Norway had fallen prey to the elaborate writings and sweet words of President Nyerere and had selected the country as one of its main recipients of development aid. Despite having the policy of „self-reliance“ as official development strategy, Tanzania accepted such help gladly and became one of Africa’s major aid recipients. One of the many Norwegian projects was the preparation of a gigantic dam at Stiegler’s Gorge. The Norwegian Agency for Development (NORAD) spent over 24 million US-Dollars in the 1970ies up to 1983 in preparing the project. The idea was to have a dam of maximum size with the single purpose of producing electricity. Soon the opposition from scientists at the University of Dar es Salaam grew. Even NORAD staff voiced increasingly criticisms that were aimed at the socio-economic and ecological impacts of the dam. Their concerns centered around health problems, insufficient electricity-needs of the country, negative economics of the dam and technical issues of the construction and the management of the dam that could overburden Tanzania. The World Bank refused to co-finance the project. It is reported that critics of the project were marginalized and that their access to the project site and the existing studies and plans was prohibited. This referred even to the official Tanzanian research agencies. More and more it was understood that the dam, if realized, would become a national economic, social and environmental disaster. In 1988 NORAD itself stated that the dam would have become an economic disaster, if built. Finally the project was shelved around 1983 and the workers and engineers left. Meanwhile in 1982 UNESCO had declared the reserve a World Heritage Site. The dam was noted as a threat to the integrity of the Selous in the IUCN technical review of the 1982 World Heritage Nomination document, but it was then clear already that it would not be built. Despite this new status nobody cared to clean up the enormous amount of buildings, trash and scrap materials that had accumulated at the site over the years. I remember to wade in 1987 through many thousands of medicinal ampoules in and around the dispensaries that catered for the once 2000 workers at the site. We wrote to the Norwegian Embassy to draw their attention to this scandal, but there was no response. When the last workers had left, the Wildlife Division found out that almost all the rhinos in the area had been poached and that the elephants had been drastically reduced. In the 1981 aerial census report it was stated that the density of elephant skeletons was „highest along the lower Rufiji River“. Together with major rhino and elephant poaching that occurred at the same time in the Southern Selous during oil exploration, the downfall of the pachyderms in the reserve had well started. In 1975 the Government established the Rufiji Basin Development Authority (RUBADA) in order to develop the area along the river. The main objective was clearly the construction of the dam. When this project stalled, the parastatal continued to exist, comparable to the Ministry of the Colonies in Italy that also managed to survive the end of the Second World War. Whereas the Italian Ministry was at least closed down eight years after the country lost its colonies, RUBADA contined to exist for another 35 years. A high two-digit number of staff inhabited a massive four-story-administrative building in Dar es Salaam’s Shekilanga Road. Since its foundation the parastatal did very little except paying large salaries and administering itself. RUBADA’s only Selous related activity in those years was to lease out a couple of buildings close to the Gorge to quickly changing tourist operators. None of them had any visitors worth to mention, although one owner even brought a witch doctor to the site in order to improve his entrepreneurial success. He also asked to be allowed to bring in a live goat, which was to be slaughtered by the medicine man, but the warden declined. In the 1990ies RUBADA also started to “extort” money from the lodge operators along the Rufiji, even though only the Selous Game Reserve Administration had the right to grant leases for tourist operations in the reserve. It is said that several lodge owners paid significant amounts. RUBADA kept the dam topic alive and found finally an ally in the person of the Minister for Water, Edward Lowassa. This Minister liked big projects. He had already convinced Japan to build a dam at Kidunda, at the northeastern edge of the Selous. A rational justification for the dam at that site was absent. The only logical explanation for this undertaking were the fringe benefits that its construction would bring about for those members of the Tanzanian elite, who would be close to the project. There were much better options to supply Dar es Salaam with water, and technically the site was completely unsuitable for a dam, as the area is completely flat and has other disadvantages. Fortunately we could convince the Japanese Government and later the World Bank not to finance the project. It would have flooded the so-called Gonabis Pan, a flat Wildlife Management Area that was indispensable dry season grazing of the reserve’s northern sector antelopes and buffaloes. Today, 15 years later, not a single probe with a spade has been done. Lowassa would not have benefited anyway. He became Prime Minister in 2005 and was one of the very few Tanzanian politicians who were kicked out of a high office because of a corruption scandal. He later moved to the opposition party and run for President, however lost against the present President. During his time RUBADA and the Brazilian Odebrecht Company joined hands to have a second attempt to build the Stiegler’s dam. Two soul-mates had obviously found each other. We do not know how much the Prime Minister was involved. We do know now, however, that Odebrecht bribed Governments and politicians all over the world, and it is difficult to believe that Tanzania was the only exception. Newspapers wrote that Odebrecht created the world’s biggest bribery ring, and a US-court imposed a multi-billion-fine. In Tanzania Odebrecht consultants advanced the construction plans. Ecological considerations or even an Environmental Impact Analysis were unheard of. Selous management, UNESCO, Conservation NGOs and foreign Governments, notably Germany und the United States, which tried to support the Government in saving the remaining elephants could follow the developments with disbelieving amazement only. In the course of the Odebrecht scandal the company disappeared from Tanzania as silently as it had entered the scene, however. The CEO and the top management of RUBADA also disappeared. They had had been involved in major embezzlement of company funds and lost their jobs. In late 2017 RUBADA was finally closed down, and the responsibility for building the dam has been transferred to the parastatal electricity supplier TANESCO, another company known for inefficiency and major financial scandals, by accident even for the one that was responsible for Lowassa’s end as Prime Minister. The plans to build the dam had been meanwhile been taken up by the highest authority of the country, the President. The World Heritage Committee (WHC) observed with “utmost concern” the different major projects, including the Stiegler’s dam, which were being pushed by the Government in the Selous. It made clear that big dams and mining were incompatible with the World Heritage status, as they would “cause serious and irreversible damage to the property’s Outstanding Universal Value.” WHC urged therefore at every opportunity, for example during its Conference of Parties in St. Petersburg in 2012, “the state party to abandon plans for the different development projects which are incompatible with the World Heritage status of the property”.